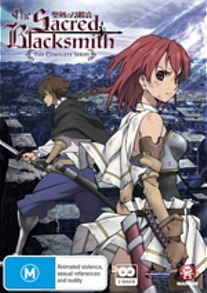 ‘The Sacred Blacksmith (The Complete Series)’ follows the story of Cecily and Luke, a young female knight and the last katana blacksmith within the neutral state. The series is based 44 years after the great war. Demon’s are riddled throughout this fantasy world due to the practice of signing Demon Contracts, by means of which the person signing the contract gives their body or heart over to a demon in order to gain their desires. The forms in which demon’s can take include the creation of ‘Demon swords’ which possess special abilities, usually along the lines of manipulating forces of nature. The series is based over a period where there is a desire for a new ‘sacred sword’ to continue binding the ‘god’ that was sealed away during the last war. The story behind this isn’t all that well explained, it is never said why this ‘god’ started a war in the first place, or much else background. The anime explains it almost as if saying: There was a war; there were lots of demons in this war, yeah, we’re running out of ideas, this god was sealed away, lots of people are scared. A majority of the episodes are rather pointless, and in a 12 episode anime claiming to be “The Complete Series”, having more than 3/4 of your episodes being unnecessary in evolving the plot is a negative point. They focus a fair bit in the first few episodes on the main characters over-proportioned breast, but this fan-servicing is kind of repetitive. It provides a few laughs the first few times, then just isn’t that funny, the writers must have realised this, because it died out and wasn’t there in the last few episodes. Engaging special effects and rather cool fighting sequences are brought about due to the ‘demon swords’ and the Blacksmith’s unique ability with his little helper to speedily create a weapon in the midst of combat. They are visually pleasing, however, not enough to make up for the rest of the time. My main criticism with this series is that it claims to be “The Complete Series”, but it’s anything but complete. NOTHING HAPPENS. The entire series seems pointless, and when you expect a climax towards the end, it’s completely anti-climactic, they don’t explain why this guy suddenly appears and begins to try and use demon contracts to control demons and destroy everything. In the last episode, he gives a one line reason, without explaining any thoughts behind the reason, but it’s easy to understand what he’s implying, but what is his motivation behind this? I guess you’ll probably have to read the Manga, but the series provides no inspiration to do that. All that ended up happening was it left me saying “How is this complete?” It seems like it is only half an arc in a storyline, it’s not even a complete arc, let alone a complete series. While I didn’t hate the series, and didn’t mind watching it, I wouldn’t recommend you watch it, unless you have nothing better to watch, or nothing to do with your life. There might be something I’m missing and I’m sure a fan of the manga will say “Read the Manga, it makes the series much better.” But there is no incentive to read it after watching this.